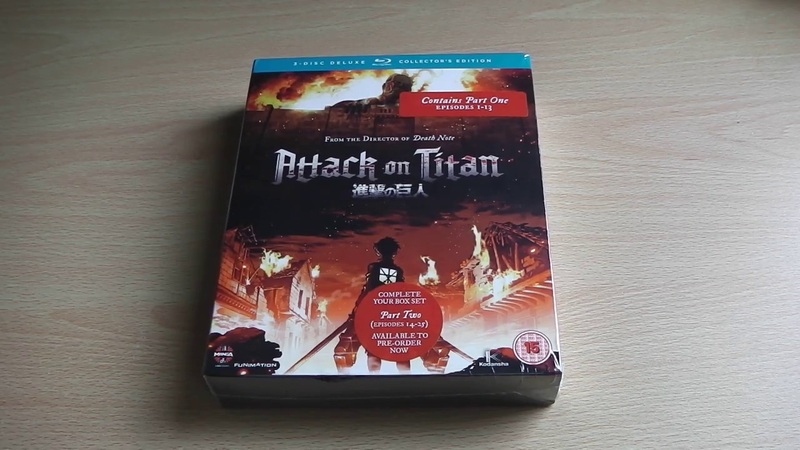 Today sees the UK release of Attack on Titan – Part 1 on DVD and Blu-ray; and what better way to celebrate it’s arrival than by unboxing the Deluxe Collectors Edition bundle. Don’t get too excited though as depsite its “impressive” title the Collectors Edition bundle is actually quite disappointing for tedious reasons. For starters on the front we have the “3-Disc Deluxe Collectors Edition” banner right at the very top of the carded box, a banner which results in the whole illusion of a complete series set being thrown out the window. This “illusion” is continuted to be broke when the back of the box features the synopsis (and information) for Part 1. Amusingly the front (and spine) of the carded sleeve/box does not say “Part 1: Episodes 1 to 13” where as the cover on the front (and spine) of the Blu-ray case says “Part 1: Episodes 1 to 13” – this indicates that Manga UK were attempting to design the box like a complete series set but for whatever reason ruined it by placing the “3 Disc Deluxe Collectors Edition” banner on the front of the box and the Part 1 product info on the back of the box. Speaking of the box, which both part 1 and part 2 are ment to fit in, it feels extremely cheap and flimsy – meaning it will easily get damaged, if not ripped, after a short period of time.In hindsight this box has the same faults as those found within the Fullmetal Alchemist: Brotherhood – Collection 1 box, although unlike that box this Attack on Titan features plenty of ‘tedious’ errors and faults – it’s a good idea of fitting both sets into a single box but unfortunately it has been pathetically pulled off. The only redeeming piece of content is the 24-page booklet, a book which features character backgrounds and a selection of comic theatre episodes. The book is informative and ‘amusingly’ produced quite well. 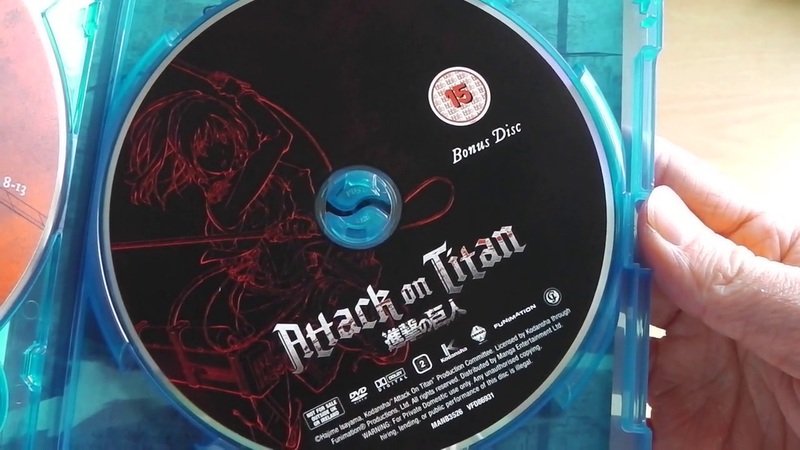 In terms of disc related content the Collectors Edition of Attack on Titan – Part 1 contains the first 13 episodes of the series across two Blu-ray discs, each of which are in beautiful 1080p high definition, while the third discs contains all of the bonus content, such as trailers, promotional materials and mini-episodes. Disappointingly this ‘third’ disc is only a DVD and as such the bonus materials are all in standard definition, which is a big disappointment considering the US Blu-ray release had all of its extra features in High Definition and part of the usual 2-disc set. 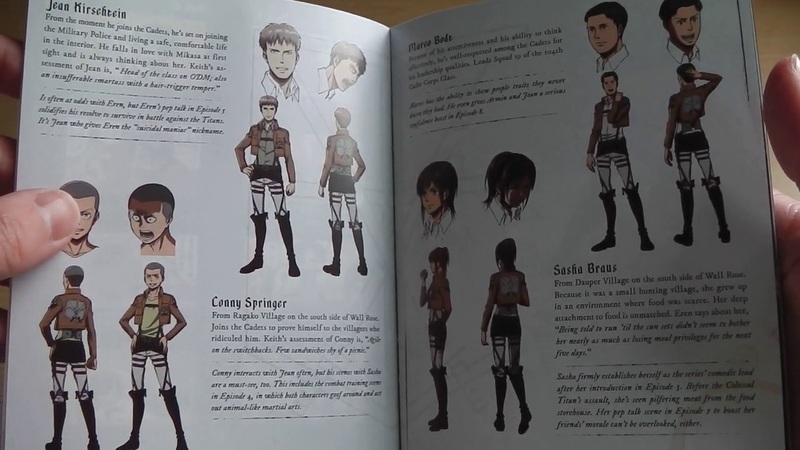 Overall the Collectors Edition version of Attack on Titan – Part 1 is one big mass of disappointment. Sure it’s a great idea, as who wouldn’t like fitting both sets into a single box to offer the illusion of a complete series set, but the way it has been produced (provided) leaves much to be desired. Of course ‘over-looking’ these disappointments you do receive a pretty in-depth booklet and a wealth of bonus materials (even if it is Standard Definition only), something which are included in the regular release. Attack on Titan – Part 1 is now available within the UK on DVD, Blu-ray and Collectors Edition Blu-ray; but whichever you decide is up to you! Both Amazon and Zavvi have delivered this CE to me, both have been dmaged. The case gets crushed so easily in post because it’s so weak and the white cardboard spacer that’s also toally flimsy and has nothing inside it does nothing to prevent it being damaged. Without a doubt the worst CE packaging I’ve seen in many years of collecting. The chapters are placed mostly at random too, and the sub timing is often off, why these things were changed for the UK release when they were fine in the US release (from what I’ve read), I have no idea. The extras are on blu ray in the US too, instead of DVD like they are here. Really bad UK release overall imo. It’s only a thin card so its understandable that it would get crushed. It seems like a nice thing to have, but… yeah, it doesn’t have a lot of redeeming content. The art-booklet seems very nice, but the extra disc… wow, it’s not even a blu-ray..? Seems very awkwardly done. They should have had this as the regular edition. I’m not sure why deluxe sets always just contain an art booklet anyways. Eitherway, I have the regular complete season 1 boxset. I mean sure, it has no fancy artbooklet, but better than something that has its price raised just to have an artbooklet.